WizzCash has been providing low APR and convenient short term loans since 2012. They got in the business to propose a super easy and cheaper alternative to the other products that were available at this time. More importantly they were and are still committed to responsible lending. They were one of the few UK lenders at the time to propose installment loans. However since the recent market regulations and price cap, those product blossomed and are more and more common. Concretely, Wizzcash proposes you to borrow between an amount between £300 to £1,000 for a unique term of 3 months. Repayments are monthly and of an equal amount. Their APR is 1,265% but what is easier to understand is the daily interest rate: 0.8% per day. So if you borrow £100 for a year, that represents a daily interest of £0.8. 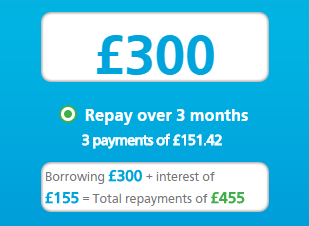 New customers can borrow up to £300 and repeat customers up to £1,000 - depending on your situation. The free application is online only. No need to call them and ask to complete an application. Just follow the simple steps online. Select the amount you would like to borrow and click the 'Apply now' button. You will then have to complete some questions that will help Wizzcash understand better who you are and why you need the loan for ; as well as your repayment means. With this information they will conduct some affordability checks and will give you an instant decision. If you application is provisionally accepted, someone from their team will get in touch by phone or email to validate some details and then the funds will be sent. Please note that if you application is rejected with Wizzcash, your application will be sent to an alternative loan provider that might find a suitable loan for you. If you do not want this to happen, just close your browser window as soon as you are told you are rejected. Funds are usually sent to your bank within 2 hours (some banks take a longer time to process it). They accept early repayments and will only charge you for the interest accrued to date (not for the full amount) without any extra fees. Just go to your account and follow the simple steps to repay. If at any point you realise you might miss a monthly payment, get in touch with Wizzcash as soon as possible and they will try to re-schedule your payments. You will be charged the daily interest but no extra fee will apply. Your must be over 18 years old, a UK resident and be currently employed and earn a minimum of £750/month. To complete your application you will also be asked for a valid phone number and email address. They also conduct credit checks but you can still apply if you have poor credit rating as they use a combination of factors to make a decision.